Here we create the statements in the front end application. It can either a java / vb.net or any other application. API acts as an Interface between the application and database. API is collection of libraries. It collects the statement from the application and divides the statement into packets. Adds upper layer to the packets taken from API. It prints from and to address on the packets and sends it to the Server. It collects the packets sent by the Client Net Libraries and removes the layer build by the protocol component. ODS means Open Data Source. It keeps the packets in the order. It checks for the syntax in the statement. Suppose if there is any syntax error it raises that error. Checks whether object exists or not. Suppose if the object doesn’t exist then it raises error. Checks for the permissions for the object in the database. Checks whether the Username and password are correct or not. 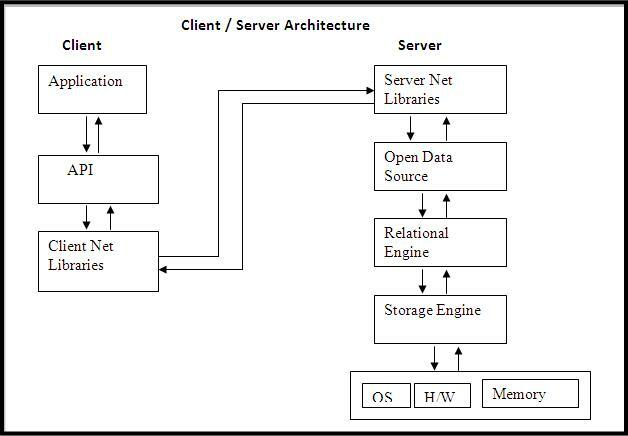 It is calculated in terms of I/O cost, CPU and memory utilization. It takes the most appropriate execution plan ie., takes the optimization query and keeps in the memory so that from the next time onwards it executes the statement taking from the memory.